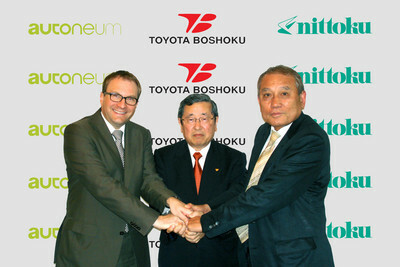 (Kariya, Japan) August 27, 2012 – Toyota Boshoku Corporation, Autoneum and Nihon Tokushu Toryo Co., Ltd. have signed a Memorandum of Understanding in which the parties have agreed to establish a strategic and cooperative automotive interior business relationship. Toyota Boshoku, a leading total automobile interior system supplier that develops and manufactures seats and interior trims, Autoneum and Nihon Tokushu Toryo, leading suppliers of engine room components and interior carpets as well as other products in the field of soundproof components, will combine their specific expertise and collective innovation power. The parties have agreed to work together to create proposals to provide high quality packages that improve noise and vibration performance in interior systems for next generation automobiles. Toyota Boshoku’s President Toyoda stated that through this agreement “we will combine our strengthens as global interior system integrators that propose and provide superior interior systems to the world’s car makers by leveraging Toyota Boshoku’s interior business and Autoneum and Nihon Tokushu Toryo’s first-rate acoustic technology”.